Elle and Laurie are the last ones standing: they're single, they're not having babies any time soon and their weekends aren't filled with joyful meetings about mortgages. For Elle, this is fine - she likes her independent life, she loves her job, and she has no desire to walk down the aisle anytime soon. But Laurie wants love and she wants it now. So when Laurie begs Elle to come with her on a singles holiday to a beautiful vineyard in Tuscany, Elle is reluctant. You Had Me at Merlot Holidays promises crisp sunshine, fun and a chance to stir up some sizzling romance. Elle has no intention of swapping her perfectly lovely life for someone else's idea of her Mr Perfect, but ten days under the Italian sun with her best friend and lashings of wine? How bad could that be? This book was my own purchase. Lisa Dickenson is one of many authors I've been desperatly wanting to read something of. Sunathon was the perfect time to finally pick up my first read by Lisa Dickenson. I coudn't have choosen something better as You Had Me at Merlot for a start. 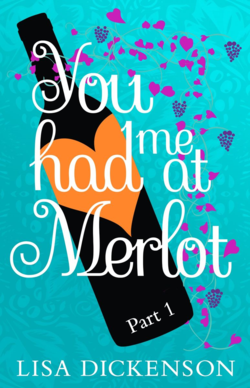 You Had Me at Merlot will be published in four parts during July and August. Part 1 is a wonderful teaser for what is still to come! I was looking for a light hearted, funny and incredibly easy read. That's what I got. In You Had Me at Merlot we meet Elle and her best friend Laurie. Elle loves her life as single. None obligations, not accountable to anyone. She is very dedicated to her work. Working as a marketing manager in a PR agency in London she gives up a lot free time get a better position in the company. Laurie is quite the opposit to her. She is ready to settle down, finding to marry, get kids and someone to grow old with. Laurie thinks that a holiday is what they both need. Not just a ordinary holiday. Laurie booked a two weeks single holiday in Tuscany, Italy. Expecting lot's of sunshine, beautiful scenery, lot's of wine and hot single men. You can imagine how happy Elle was about this but wouldn't you do anything to make your best friend happy? So Elle agreed to go with Laurie on this trip. Let the adventure begin... After a turbulent flight they finally arrive safely in Italy and start the preperations for the first evening. The so called "Meet & Greet" with the other participants. Even before the meeting, Elle bumbs into to a very handsome man, called Jamie, who has awaken Elle's interest. Will this holiday change Elle's mind about her life and releationships? This first part is a real page turner and it kept me entertained the whole way through the story. I couldn't believe it when I hit the last page so soon. From the first page we were off on a fast pace being drawn into the story and the book story on in this way. Lisa created a perfect cliff hanger: surprising and exciting! The ending of Part 1 makes you wanting to read the second part right away. If you like your chick-lit fun, brilliantly paced and readable, then definitely pick up a copy of You Had Me at Merlot! With a great cast of characters, a great location and a unique storyline, it's the perfect summer read. P.S. I couldn't get over Lauries Botox accident. I was laughing so hard I nearly fell out of my bed!